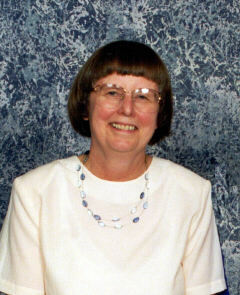 From the Editor: Doris Willoughby is an experienced blind educator. 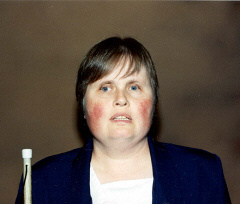 We usually think of her in connection with her wonderful text materials for�teaching blind children, but in recent years she has been working with blind adults who are earning their General Education Diplomas (GEDs) or preparing for their citizenship tests. Susan Ford is also deeply committed to Braille education. Blind people who lack basic literacy tend to fall between the cracks. Various community agencies teach literacy and Adult Basic Education (ABE), but they generally have no idea how to include someone who cannot see inkprint. Conversely, teachers of Braille or keyboarding for blind adults are generally not set up to teach basic education to a person who has not acquired such information. Their usual lessons assume that either (a) the student learned to read in inkprint and then lost his or her sight, or (b) the student can read Braille but wishes to achieve further improvement--by learning to use the slate, increasing speed, etc. Typical lessons also assume that, when a person learns to recognize the Braille letters w-a-l-k or to type those letters on a keyboard, heor she will know that the word is "walk." But for some this is not so. *English as a second language. *Sporadic and inconsistent education (those who grow up in a family that moves every few months or weeks). *Learning disabilities, serious emotional problems, etc. *The stereotyping or assumption on the part of educators that a person is a special education student and cannot be expected to learn to read or write. *Having no real mode of reading except recordings (due to print/Braille controversy or other educational issues). *Being moved along through the grades with little real progress. When a person (blind or fully sighted) lacks real literacy, often others do not realize it. For one thing people often think that illiteracy means a total lack of knowledge of reading and writing. In practice it applies to anyone who cannot read and understand such everyday things as a job application form, an instruction manual, or a newspaper. Thus a person may read signs, names, etc., and yet be functionally illiterate. A person who lacks basic literacy may be articulate and obviously intelligent and may be knowledgeable in various areas. Understandably, he or she may try to hide the problem by using other skills or by bluffing. Students without high school diplomas vary greatly in educational background. Often a person achieved reasonably well in school, completed part of high school, and then dropped out for one reason or another. For such a blind person there is no particular difficulty in learning to read Braille, understanding recipes, or using a computer. For higher education and for employment, however, it is highly desirable to complete the GED (General Education Diploma) high school equivalency tests. Many GED-preparation materials are available in Braille or on tape. Many people, however, for reasons such as those listed above, are essentially unable to read or write in any mode. Such a person is not able to use the usual GED-preparation materials because too much prior achievement is assumed. (Adult-education classes speak of the "pre-GED level.") If he or she enters a rehabilitation program, the usual instruction is fraught with difficulty. The student learns to recognize the Braille letters "c-o-l-d" but cannot say that this spells "cold." The student learns the computer keyboard but�cannot spell words. He or she then falls through the cracks. Some Braille instruction materials are suitable for adult basic literacy. These have an ordinary vocabulary (avoiding unusual words) and much repetition--yet (of crucial importance) do not seem childish. Books meant for children are sometimes used as a last resort, but they tend to undermine the self-respect of adult students. Braille Instructional Materials by Betty Jane Petersen-Neumann and James F. Borough, available from Production Processor, Michigan's Assistive Technology Resource (MATR), 1023 South U.S. 27 St. Johns, Michigan 48879-2424. Through a set of five books the Braille letters and the signs of Grade II Braille are presented in a way that greatly facilitates teaching beginning reading. The set does not present the letters in alphabetical order but instead avoids teaching two similar Braille shapes in close sequence. Phonetic analysis is emphasized in rhyming words. Single-letter contractions are taught along with the individual letters themselves. And overall there is much, much repetition--vital for the learner who is newly literate or learning English as a second language. There are approximately six to ten lines per page, encouraging the recognition of accomplishment quickly. Sentences are simple and short. All this is done without childish wording. Sample sentences include "The cook is tall. I can bat a ball. It is a lake." Many materials are designed for sighted adults who are learning basic literacy. An example is the series, Reading for Today, from Steck-Vaughn. It begins with the alphabet and the sounds of the letters. It proceeds through constructions such as the following from Book Two: "My family loves the home we rented. I can walk to work. My sister, Jan, can get to her job on the bus. My mother likes the stores in the city." The sixth book in the series is on the level of newspapers and other popular reading materials. There is a catch, however: Few, if any, of these kinds of books are readily available in Braille. We have Brailled certain selections but have not found anything ready-made. In addition to Brailling the text, one must also deal with the fact that the format of the earliest levels depends heavily on pictures. Also the sequence of presentation is not designed for Braille instruction. Usually the best method is to present the visual material orally and make some adaptations in the sequence. Do you have experience in teaching basic literacy skills to blind adults? Or are you suddenly finding that you are called upon to do so but lack materials and methods? Are you yourself someone with a need for basic literacy skills? We invite you to contact us at the following address: Doris M. Willoughby, 7775 Quail Street, Arvada, Colorado 80005. Give us your ideas and questions. Help us consider how to shape this series of articles. Perhaps we'll organize a network or group while we're at it.